I’ve shared a ton of different cakes over the years, but all of them use dairy! This is the only recipe I’ve ever I’ve ever shared that is vegan! No eggs, no butter, no buttermilk!! It uses vegetable oil in place of the butter, and almond milk in place of the buttermilk. I really love this recipe because it’s straight forward, doesn’t include any scary ingredients, and most importantly, it tastes great! I chose to flavor this with almond extract, but you could also try maple, lemon, or coconut. Preheat oven to 350°F. Prepare three 6-inch cake pans by lining them with parchment paper and greasing the bottom and sides of the pan. Begin by making the vegan almond cake layers. Whisk together flour, sugar, baking soda, and salt. Add vegetable oil, almond milk, and extracts; whisk until no lumps are left, and batter is smooth. Stir in the vinegar, and pour 1/3 of the batter into each pan. Bake about 30 minutes, until cake begins to pull away from sides and/or toothpick inserted in the center pulls out clean. Let these cool for ten to fifteen minutes in the pan, then finish cooling the layers on a wire rack. While the cakes cool, prepare the vegan almond frosting. Beat the shortening on a low speed for 1 minute using a paddle attachment, until smooth. Slowly mix in the powdered sugar on a low speed in three installments, and alternate with splashes of almond milk. Mix in the vanilla and almond extract, and beat for another 2 minutes until smooth. If desired, color with vegan food coloring. To assembly the cake, frost the top of each layer with an even layer of the frosting, and stack layers on top of each other. 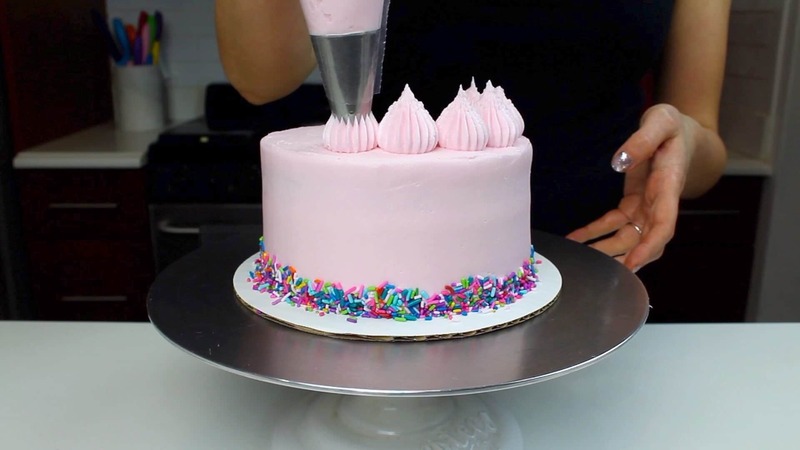 Apply a thin crumb coat of frosting, and place the cake in the fridge for about 10 minutes. Once the frosting has firmed up, cover the cake with the remaining frosting. I used a large French tip to pipe a boarder around the top edge of the cake, and covered the top with sprinkles. 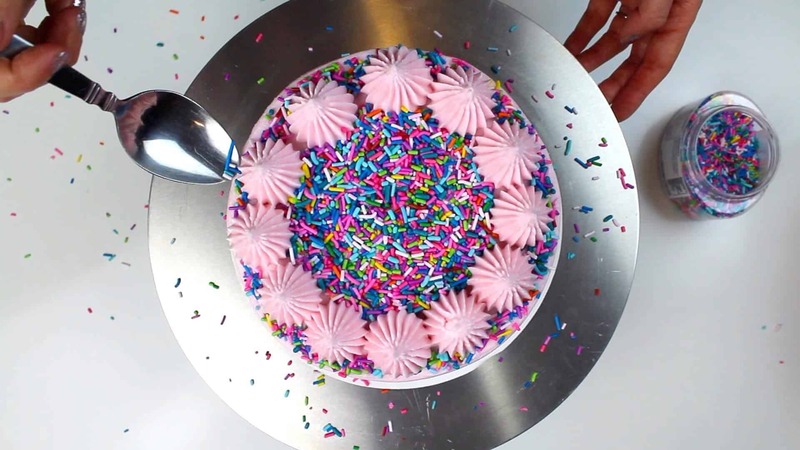 There are a lot of great vegan sprinkle brands out there, but I chose to use a vegan blend made by Fancy Sprinkles! I really love that this cake looks and tastes so much like a normal cake! The texture is a bit different than my normal cakes that are made with butter, but the layers almost reminds me of a moist olive oil cake! The almond flavor is present in both the layers and the frosting. I did find the the vegan frosting was bit more difficult to smooth than regular buttercream, but that’s to be expected since it’s made with shortening (shortening doesn’t firm up the same way butter does when chilled). Overall, I was extremely pleased with this vegan almond cake recipe. It’s so approachable and delicious!! Hey Chelsea! Is this cake also soy free? Looking for a cake recipe for my daughter’s first birthday but she’s allergic to milk and soy? If you use almond milk instead of soy milk it is! Can this be doubled and used for 4-5 7” pans? Made you recipe today and it came out amazing! Any tips on frosting? For some reason when I added a gel color to the frosting it seemed to change the entire consistency. so happy to hear that! What brand of gel food coloring are you using? i use the americolor brand and haven’t run into issues! But I also didn’t add much to achieve this light pink shade. 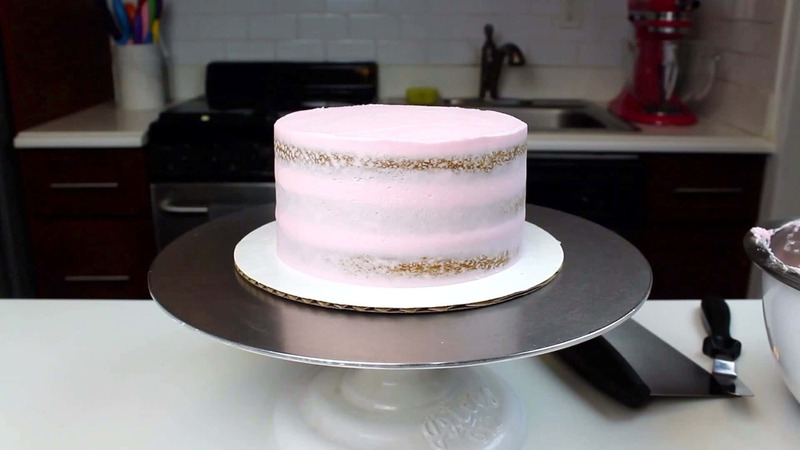 Can the unfrosted layers of this cake be frozen ahead of time like your non-vegan cakes? Thanks! Can this be amazing recipe be used for cupcakes? It can! but they don’t rise much! Hello- Is the almond extract flavoring super strong in the cake/ icing? I want a classic vanilla flavouring, so am wondering if I should just omit the almond extract all together (and what to replace it with if so). It is somewhat strong. You can try it, I just prefer another flavor in there, since there’s no butter and the shortening really doesn’t have any flavor! But if you use a high quality vanilla extract or some vanilla bean paste, it should still taste good! Hi i live in the UK and we dont have shortening here much. Any alternative? Do you have any other Vegan cake recipes or could you recommend another fellow bakers recipe? I am looking to make a vegan rainbow cake. 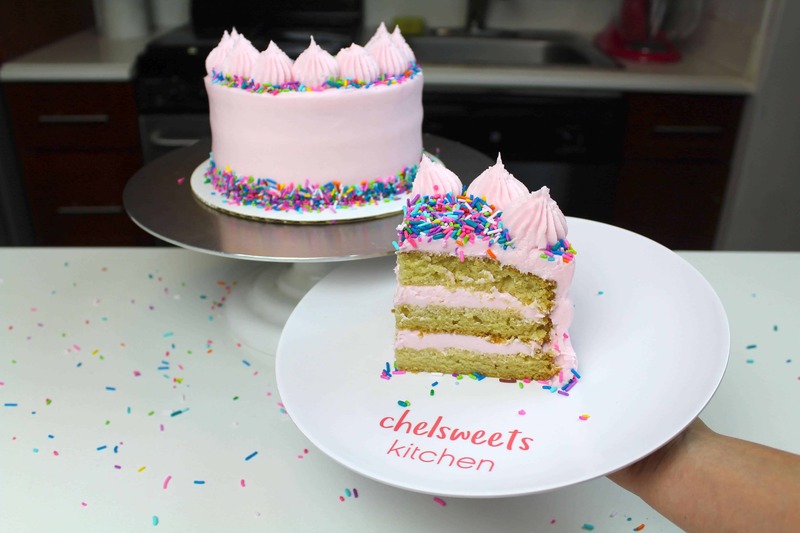 Love Love this recipe since my son is allergic to dairy I have had to find different options and now I can make him a cake for his bday without worrying that I will affect him with the Dairy and the fact that it also taste amazing. I love watching your videos. Your cakes are simple and wow worthy. I also read your blog on why you quit your job. My jaw dropped because your thought process seemed exactly like mine. Thank for your blog and sharing all that you know. I have a question about the vegan cake. Which brand of shortening did you use? I have a question about the vegan cake. Which brand of frosting did you use? I find that Crisco is too greasy. Are they other brands that probably work better? Hi! Do you have a chocolate egg free cake recipe you could share?